We're getting some really excellent games on Android as of late, and it looks like the hit parade isn't going to end in the near future. Here are three upcoming titles (in three different genres, no less) to look forward to in the next few months. Rayman Jungle Run and Rayman Fiesta Run are easily two of the best games of their type on Android, and we're getting at least one more. Ubisoft released a reveal trailer for Rayman Adventures early this morning, showing off similar gameplay with a new structure based on rescuing the "Incrediballs." The tap-and-swipe runner gameplay seems to be intact, so I'm sorry if you were hoping for a more conventional platformer. Rayman and company do seem to be able to switch their direction, which should make it easier to explore stages for full completion. The Ubiart engine continues to dazzle: Rayman Adventures shows some of the best 2D graphics I've ever seen on any platform, mobile or otherwise. Unfortunately the trailer is all we've got for this one. It confirms that the game is "coming soon" to phones and tablets, but beyond that we'll have to wait for more info. We've featured games from indie developer Butterscotch Shenanigans before - the quirky style and humor of this three-man team makes their games stand out in a crowd. Their latest and most ambitious game to date is Crashlands, a 2D survival and crafting game in the same vein as Don't Starve. 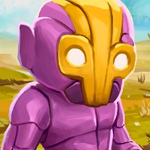 But Crashlands delivers a unique cartoon sci-fi setting and atmosphere, not to mention an appealing over-the-top approach. Crashlands will be released on Steam, iOS, and Android, with cross-platform saves that allow players to continue crafting equipment and shelter on the same seamless world. Add in some interesting ideas like an infinite auto-managed inventory, alien eggs to hatch into companions, and a simplified building system, and fans of the genre are sure to take notice. Crashlands is currently scheduled to launch late this summer. Alright, this one is a bit of a cheat, since the trailer is technically for the PC. But it looks so cool I have to mention it. Ronin is a 2D stealth platformer that stars a ninja motorcycle rider who... you know what, it doesn't matter, just look at that art style. It's like someone extracted all the angular goodness of Samurai Jack and injected it into a game. But wait, that's not all! Ronin mixes standard platforming with turn-based combat. Basically the world freezes when you get into a fight, allowing you to go all John Woo on the bad guys with insane attacks and combos. Publishing is being done by Devolver Digital, which handled the Android ports for Hotline Miami, Always Sometimes Monsters, and Luftrausers. The developer says that Ronin was specifically designed so that it will also work with touchscreens and will be coming to Android and iOS at some point.